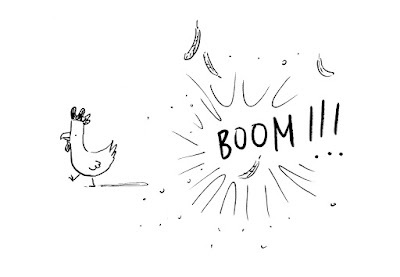 Can you beat my high score in the new Exploding Chickens game? I think not. I’m ‘TOMW’ on the leaderboard. You can play it right here or on the mobile or full-screen versions. I would love to hear any feedback. Just click Comments below and let me know what you like, what could be better and any tips for other Exploding Chicken catchers. The game was devised and prototyped by Raph Atkins – super-talented 15-year-old game designer, and built by Ben Train from Mad Egg – the genius behind my Story Scrapbook transmedia brainstorming app. The music is by wunderkind Francis Atkins. The illustrations are by the mad but brilliant Gus Gordon. Could you please create a video answering questions or talking about Two Wolves? I have been looking through the internet for something like this, but all I have found are interviews about the My Life series. Thanks! 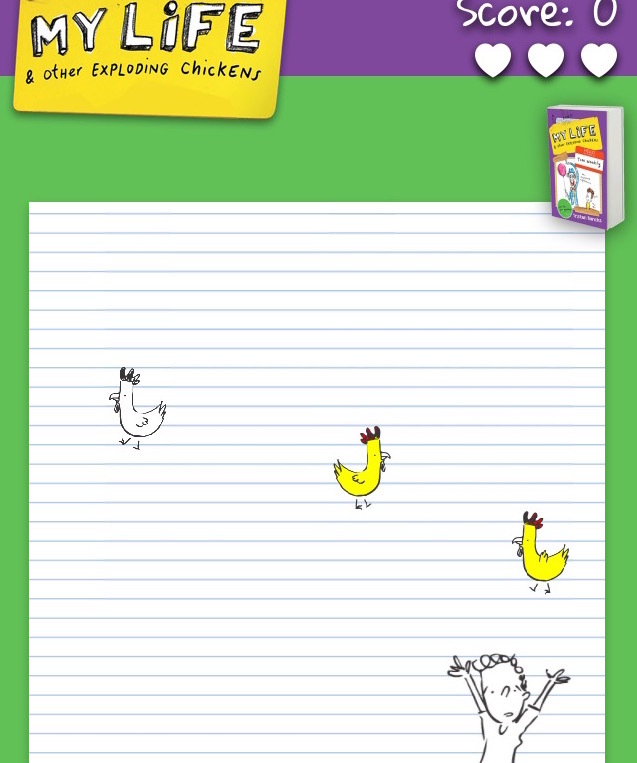 hi Tristan, i've been playing your exploding chickens game you told me about when you visited my school on Tuesday, July 19th. I also asked if my mum could get the My Life series you presented us on your visit, i'm sure they will be really exciting just like you said. From Harrison BBC. Go you! AMY9's reign must end! Someone needs to get 100,000! Just click 'Contact' on top right of my website and then click the link to email me. hey tristan me and my brother got your books today thanks for signing them!! JB88 just got 110000 on the Exploding Chickens game! Hey Lucas. I hope you smash the top score. T.
Hey Tristan! You visited my school today. But for now, I'll keep writing my book. What's pretty cool is that someone in Year 8 at our school got published. 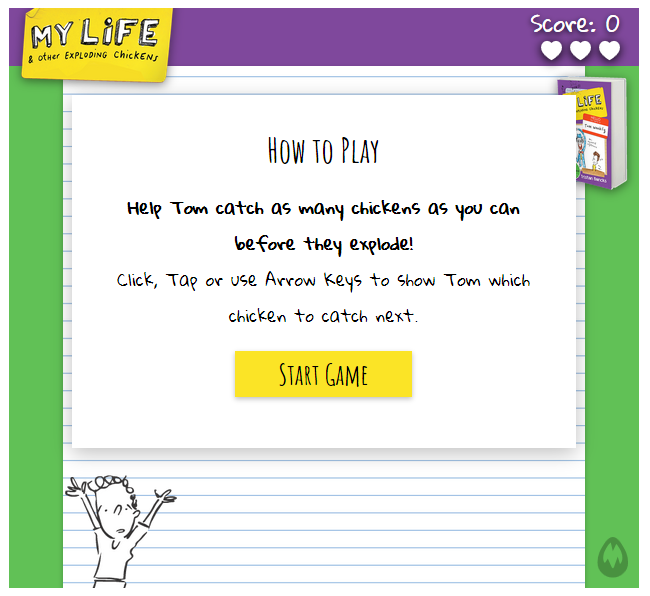 Hi Tristan, Thanks for visiting my school today (Assist Catholic College) I love the exploding chickens game. Hi Tristan Bancks, you visited my school Assisi Catholic College on Friday and I hope you remember a girl from year 4 named Bianca Fisher. I beat AMY9's score like you asked us to try and do. I am 8th on the leaderboard and my name is AAAA because it asked me to put in a name but I didnt realise so I pressed place score and now I'm AAAA on the leaderboard. If there is a way to change my name please tell me as soon as you can. P.S. 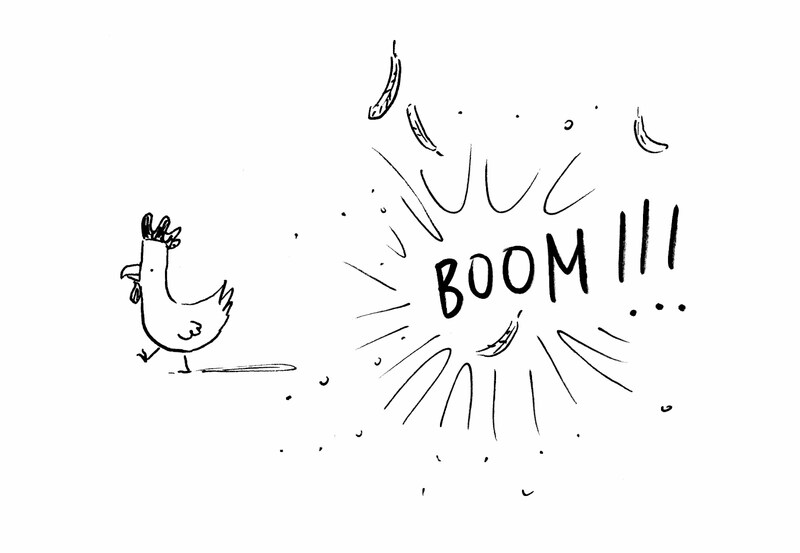 I love the exploding chickens game. No worries, Eric. It was a fun visit. Happy reading. Tristan. Sixth now. An amazing girl gamer in Hong Kong got 181,000!